Arkad Foundation – Artco Laboratory – Saturday 29 September 2018 at 21. Painter, sculptor, engraver, magician of papier-mache, ceramist, set designer, caricaturist, designer … madly in love with the Apuan Alps. Ten years after his death, the multifaceted artist from Viareggio Beppe Domenici returns to Saturday 29 September at Seravezza in the penultimate event of the cycle that accompanies the exhibition “Cava” at the Arkad Foundation. Brilliant appointment, full of anecdotes and color, on the edge of a pyrotechnic career, characterized by the great love of Domenici for his land. 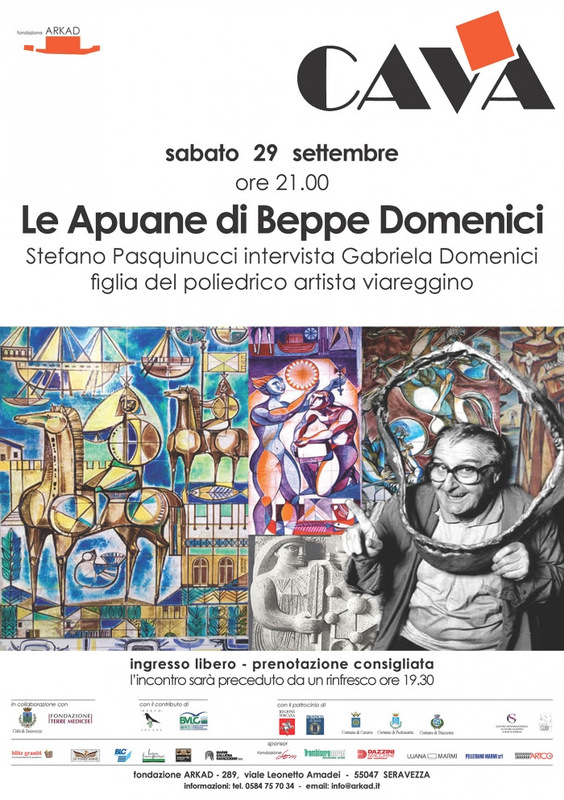 A two-way interview between the journalist Stefano Pasquinucci and the daughter of the artist, Gabriela, which will also discuss the project by Alessandro Pasquinucci for the definition of an interactive tourist route linked to the countless artistic testimonies left by Beppe Domenici in Versilia. The meeting will start at 21, preceded at 7:30 pm by a refreshment. Free admission; booking advised by calling 0584 757034 or writing toinfo@arkad.it .At the center of the interview is the theme of the Apuan Alps, which Domenici traveled far and wide and which he painted on many occasions. “Beppe, my father, was fourteen years old when he first climbed from the volcano to Mosceta to continue to the Pania cross,” says his daughter Gabriela. “He fell in love with these mighty mountains, discovering hidden hollows of marble shimmering in the midday sun in the caverns, admiring at sunset the quarries of the red Vinca tinged with pink, walking up windy and shining ridges in contemplation of peaks, ridges, cliffs, canoni … He always carried a notepad and pencil “to take notes” as he used to say. He walked, then suddenly stopped and began to draw … without ever getting tired ».